While Out Riding, Tumblr Edition. 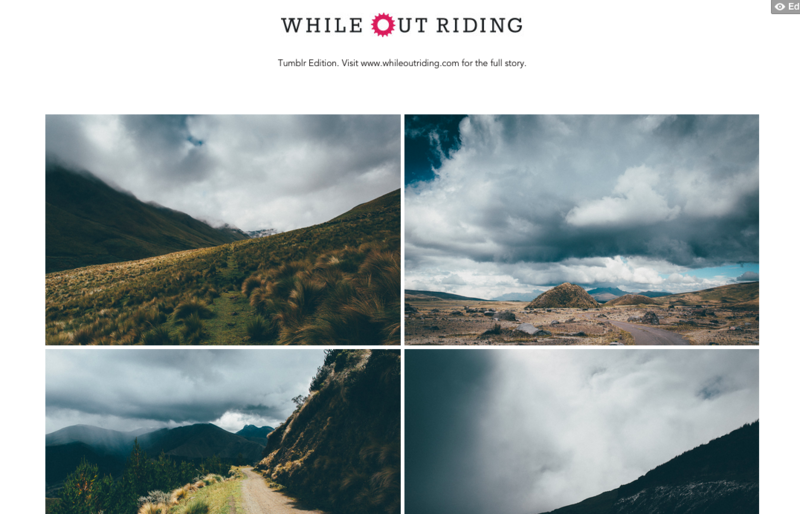 This is just a reminder that I’ve set up a Tumblr Edition for While Out Riding, with more of a photographic leaning than the standard website. It can be accessed via the homepage, or at the top of the menu column to the right. To those unfamiliar with Tumblr, it’s handy to know that you won’t be able to comment or ‘like’ an image, unless you’re signed in to Tumblr with a page yourself. But that’s fine, this sub site is really just there for me to quickly post images that may or may not eventually make it into a blog post, or to find strays a home. And to give my favourite images a chance to breathe. Tumblr posts are limited to ten photographs at a time, and as they’re relatively big – up to 1200px each – kick back and give the page a few moments to load and format into shape. It will look better that way. As an example, check out a few of the image sets from a recent Volcanic Corridor traverse of Ecuador, like here, here, and there. In time, these will be fleshed out into more expansive blog posts – so consider them a little sneak preview of what (I hope) is coming! This entry was posted in Ecuador on February 4, 2015 by Cass Gilbert. Just a heads up, the link to the “Tumblr Edition” in the post isn’t functioning properly. Loving the new photos of Sage and Nancy, looks like everyone is having an absolute blast. Thanks Brendan. Should be all sorted now. Looks beautiful, Cass. Seems like I’ll have to get my bike and camera to Ecuador. I’m restricted to July and August for vacation for the next couple of years. Looking forward to the blog posts. How’s Ecuador for a S. American intro? I’d say Ecuador would be an awesome intro. Its compact size means you get a real feel for it in a couple of months. Easy logistics. Safe. Good infrastructure. Very reasonably priced. Cheap, hearty meals and lots of veg and fruit! Good camping. Loads of dirt roads (though as with anywhere, the country is in the midst of throwing down slabs of pavement in its plight to ‘modernize’), as well as the beautiful open paramo. A real variety of terrain and cultures, once you factor in the Amazon too. And July and August are good months to be in the mountains. This said, the Bolivian altiplano and Peru (like the Cordillera Blanca, and the ‘Divide Route’ south towards Cuzco) spring to mind around as great 8 week destinations too. But I’m definitely a big fan of backcountry Ecuador, as a whole package. Great to hear; I’ll pencil it in for 2016 (committed to riding the Camino Del Norte – parallel but less popular than the Camino de Santiago – this summer). I’ve always been a bit intimidated by S. America but I’m pretty much out of excuses now. What are your plans? Back to the US for a while or staying in the south? The Camino Del Norte sounds great. The tarp is the fly sheet from an old Eureka tent and just so happens to sit perfectly over an upturned bike. It keeps the bike dry, no need for poles, it’s super stable, but not the lightest option, as it comes from a relatively heavyweight tent. A lightweight version would be awesome! Unfortunately I don’t have any details, as I borrowed it from some friends. Personally, I’m a big fan of the various ‘mids. I have a Black Diamond Megalite, but there are better ones now on the market now, I think. If it’s just me, the Megalite fits the bike in easy. Without a bike, there’s room for 3, comfortably – with lots of head space and cooking space. For solo stuff, I have a Tarptent Contrail (fully enclosed), and I just bought a 6 Moon Designs Deschutes on sale.